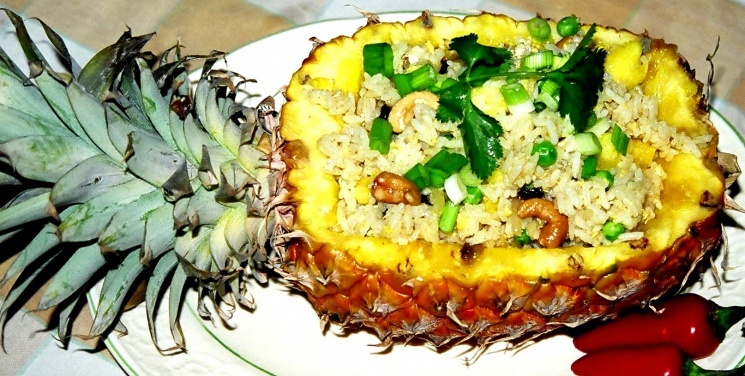 The pineapple adds a touch of tart sweetness to this dish. It has a rich creamy texture, and a red coloration that is an attractive complement to the shrimp. 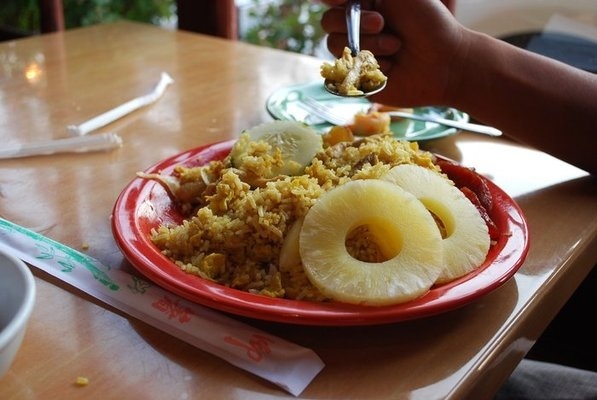 If you want to be a little fancy you can serve it in pineapple skin bowls. Peel, devein, and behead the shrimp, leaving only the small tail shells on. Drop two tomatoes into boiling water for about a minute, then remove to cold water, peel, quarter, discard the seed pulp, and chop the flesh. You want 2 tablespoons of chopped tomatoes. In a little oil in a medium hot wok briefly saute the garlic and basil, removing it and reserving it when the aroma is fully developed. Cook the curry paste briefly to develop the aroma, then add half the coconut milk, the fish sauce, tomatoes, pineapple, lime juice and sugar. Stir to combine fully. Add the prawns and cook until they turn slightly pink and opaque. Add the remainder of the coconut milk, the lime leaves and slivered chili, at the same time returning the sauted garlic and basil to the pan. 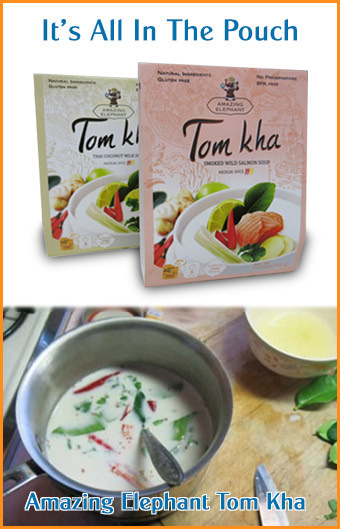 Transfer to a serving dish and serve with steamed Thai jasmine rice. very good recipe for a marvellous dish. I first tasted this at a Thai restaurant in the Memphis area. Loved it! I ordered the ingredients from importfood.com and made it myself today. Unbelievable combination of flavors! Thanks for posting this recipe... And for carrying the ingredients to allow a home cook like me to create it in my own kitchen. This dish is absolutely delicious! I have tried several variations including substituting tofu for the shrimp (tofu must be dried and fried in curry paste). I typically double the amount of pineapple and basil... you'll find yourself wanting more of these after making this the first time. This is an outstanding recipe! Use the ingredients, change the method: 1) Heat oil until just smoking, 2) Add basil first, then add garlic, when garlic is dark, remove and reserve both , 3) Add slivered chile, cook until dark, 4) Add Curry Paste, cook until it breaks down a bit, 5) Add Shrimp, fry until pink 6) Add remaining ingredients and bring to a boil, cook until everything is well combined. Serve immediately over rice. We prefer half of the coconut milk, double basil, tomato, and pineapple, kaffir or lime leaves are essential, it makes a huge difference! This was really delicious, despite a few substitutions I had to make. Passed it on to my kids and have already received back rave reviews from the ones who've tried it. Will go on our regular rotation of deliciousness! I'm planning to make this today. It doesn't show how many it serves. I'm cooking for 10 to 12 people. If you can respond quickly I'd appreciate it. This is one of my "go to" dishes, when they upgraded their website I couldn't find the recipe initially and I freaked out. It's THAT good.